We need to take a collective breath, peal away the perceived complexity of the story, and get down to a basic question: Why is it so hard to apologize? Screen capture from Washington Post story on the stand off. The latest chapter in the saga was Sandmann’s nationally broadcast interview on the Today Show. A quick reset: Sandmann and his mostly white classmates from Covington Catholic High School in Kentucky were in D.C. for the anti-abortion “March for Life” rally. Phillips was in town for the Indigenous Peoples March. Both marches ended near the Lincoln Memorial. According to news accounts, a nearby group of Black Hebrew Israelites stirred emotions by hurling racial insults at both groups. Phillips said he started playing his drum and singing to try to ease tensions, walking in between the two groups. The high schoolers, apparently rattled by the racial conflict, responded to Phillips in a disrespectful way — tomahawk chops and ugly comments. 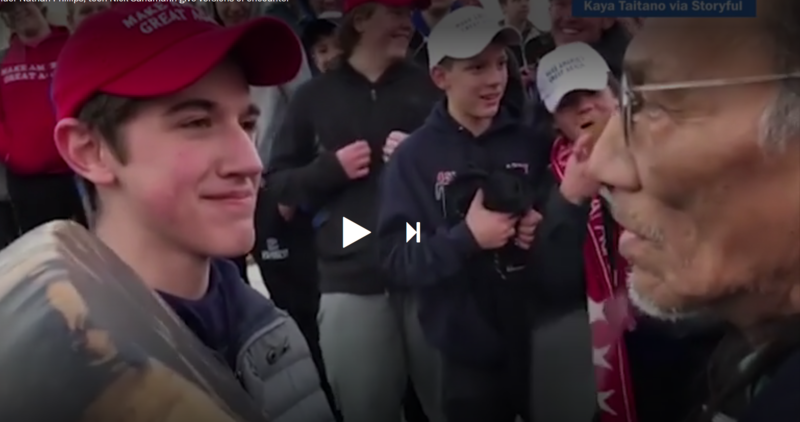 Video of Friday’s standoff showed some students, including Sandmann, wearing pro-Trump MAGA hats. It’s become clear over the past two years that in President Trump’s America, apologies are seen as a sign of weakness. Sandmann seems to have adopted Trump’s stance on apologies, along with his hat. In the Today Show interview, Sandmann was defensive and claimed his right to stand his ground rather than show some humility. In fairness to Sandmann, he’s young and was and ill prepared to be in the national spotlight. The adults in his life did him a disservice letting him go on TV. Here are some of the key exchanges. Comment: No olive branch here. Sandmann framed his answers around personal rights. It shouldn’t have been that hard to apologize. With hindsight, Phillips could have acknowledged the “Tomahawk chop” gestures by his classmates were offensive and that Phillips could have felt intimidated being surrounded by the chanting crowd. Most importantly, Sandmann knew Phillips stated intent was to diffuse the racial tension. Sandmann could at least have expressed gratitude to Phillips for his good intentions and for taking the risk to step in and help. Further, Sandmann’s statement that “I was not disrespectful to Mr. Phillips” assumes he alone has the right to decide what is disrespectful; he shows no curiosity about how Phillips felt. Guthrie also asked Sandmann about the central controversy of the exchange — his perceived smirk as he stood in front of Phillips. Comment: If it was a smile, it was a defiant smile, not a friendly one. Sandmann apparently saw Phillips as a threat. He perceived Phillips was trying to provoke him into an angry response. Sandmann perceived Phillips was there “to hit this drum in my face.” He didn’t acknowledge, and implicitly rejected, Phillips’ explanation that he was there to be a peacemaker. This conflicts with Sandmann’s earlier statement that he was standing in front of Phillips to listen to him. It doesn’t seem Sandmann was listening at all. Sandmann was there because he thought that Phillips was provoking him to anger. It was a me-against-you moment; Sandmann wanted to show Phillips he was too strong to be provoked. Why is it so hard to apologize? In this case, Sandmann seems to have a fixed story — Phillips was there to make people angry. Until he has enough humility to question whether that story is true, there can never be a human connection, apology, or healing. My hope is that at some point in time Sandmann will apologize. And it’s a lesson for all of us: when do we/I jump to conclusions about other cultures we don’t fully understand? when do we/I need to apologize even when we don’t fully understand?